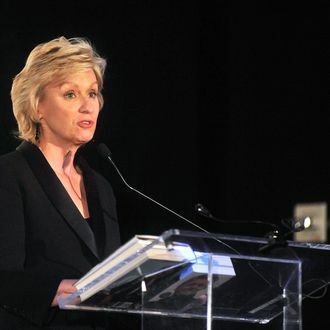 Onetime Queen of Buzz and soon-to-be former Daily Beast editor Tina Brown may not even believe what she says anymore. During an appearance on Morning Joe, Brown predicted that her new venture, conference-hosting company Tina Brown Live Media, will be successful because — despite a great deal of evidence to the contrary — people don’t really like gazing into their phones and iPads and laptops all that much. “In the world of screens, we’re all tired of screens,” she said. “That’s why I think that live events have become so popular. Because I think people actually want to get away from these. They actually want to go out and have some human warm bodies.” That statement was preceded by Brown explaining that “the challenge” of putting on a good live event is that “you have to keep those eyeballs up there and not down here” while holding up her own phone. Question: If nobody tweets a “sponsor-supported summit, salon or flash debate,” did it actually happen?